When I was growing up, my mother always used to tell us to "Go outside!" That was usually followed by, "and blow the stink off ya!" Since this is school vacation week, it may be a good time to go outside. Look at what New Hampshire is like in winter. Try walking in your own backyard, or take a stroll down the Windham Rail Trail. If you want to go further, the NH Audubon sites in Concord or Auburn, are worth a trip. If the ground is covered with snow, you may be lucky enough to find animal tracks! 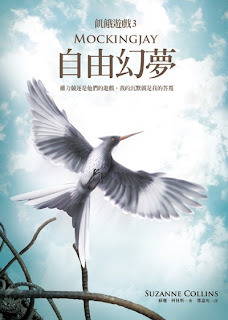 It may be fun to read a book such as Animal Tracks by Karen Latchana Kenney [J 591.479 KEN], Footprints in the Snow by Cynthia Benjamin [E BEN], or Who's Been Here? 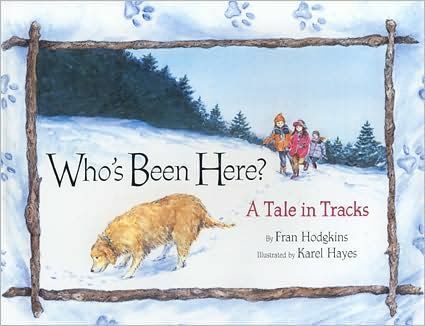 : A Tale in Tracks by Fran Hodgkins [JP HOD]. Karel Hayes, the illustrator of Who's Been Here?, lives in NH! We have several books in the adult section about animal tracks, including The Science and Art of Tracking by Tom Brown [599 BRO]. I hope to see you outside enjoying the winter wonderland that is New Hampshire! If your child anticipating attending college in the next few years, we have a number of items that may be of interest. 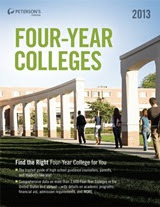 First off, there are the standard guides, such as Peterson's Four Year Colleges. We keep the latest edition in reference, so look for R 378.7 PET 2013. Older editions of guides are kept on the regular nonfiction shelves. On our website is a section called "College-Bound," which contains links to a multitude of sources--everything from scholarship information to where you can buy textbooks. The other day I read an article titled "Top 10 Colleges with the Happiest Students." It has a slideshow of the ten colleges, and looking at the beautiful settings pictured makes me want to go back to school! The article originally came from a website that offers 100,000+ free college reviews, Unigo.com. Of course, Unigo also wants to sell you their Absolute Admit™ college course, but, you can just use the site for its free information. Good luck with the college hunting and I hope your kids find a school that gives them a great education, and one that can also them happy. Isn't it amazing the way we are able to get such clear and stunning films of the sun's surface! Why am I featuring penguins today? Could it have something to do with THREE weekends in a row of snow? I'm beginning to feel like New Hampshire has slipped down to the South Pole! One of the features of the lower southern hemisphere is penguins. Their sleek little shapes remind humans of funny little men in tuxedos. They're hard not to smile at! On our shelf we have March of the Penguins [DVD 598.47 MAR], a feature-length documentary which I highly recommend. Be aware though, that it's not all smiles in the real world of penguins. You can see more Pingu episodes in the DVD Meet Pingu [J DVD MEE]. And, need I mention the dozens and dozens of penguin books we have on our shelves? We've got everything from board books for toddlers (Planet Earth: Baby Penguins [BB PEN]) to over-sized picture books (365 Penguins by Jean-Luc Fromental [JP FRO]) to nonfiction for older kids (Smithsonian Q&A: Penguins by Lloyd S. David [598.47 DAV]). What's not to love about penguins? Are out on sunny days. All waving in the breeze. And paint the peaches’ cheeks. Ah! There’s a tiny fairy! She’s in the garden bed! Who makes the roses red. 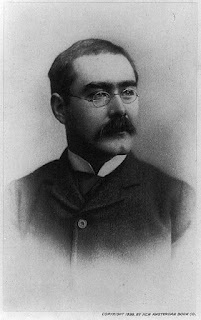 A little research led me to a whole collection of fairy poems written by Wilder back nearly 100 years ago. The poems were compiled in 1998 in Laura Ingalls Wilder's Fairy Poems. 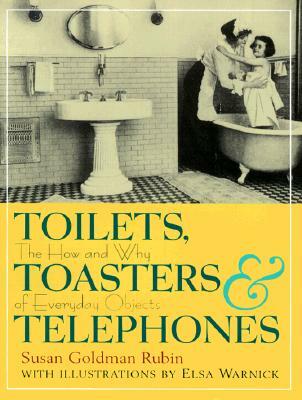 The book is out-of-print, but a copy is available at the Derry Public Library, or other libraries through interlibrary loan. For the Poetry Friday Round-Up this week, you must visit Sheri Doyle! 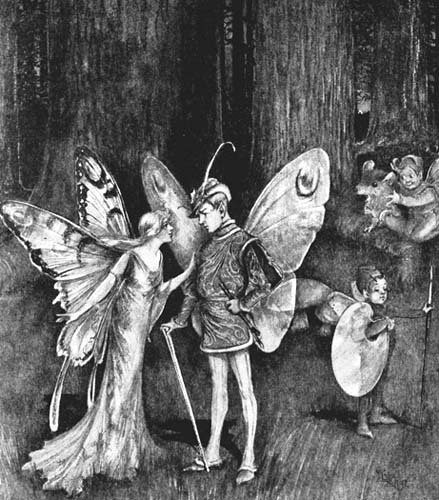 Fairy stories have been around for as long as there have been people to tell stories. Listeners always relish a little sparkle, magic, and romance. I found a Pinterest board that may be of interest to fairy and fairytale aficionados--Fairy Tale Inspiration. The board's owner has collected a variety of things to use as inspiration for writing her own fairytales. 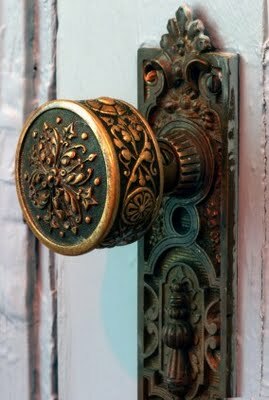 You'll find tiaras, unicorn tears, and even a doorknob! Fears breed fears, and if we who are at present the strongest nation in the world have fear, we will breed it in other people. That is one reason why I dislike to see us so often take a negative attitude, both in our domestic affairs and in our foreign policy. I should like to see this country be for certain definite programs and go out and achieve them. Psychologically, that is a better attitude of mind in the world of the present. Eleanor Roosevelt wrote the above in her February 20, 1947 daily newspaper column called "My Day." If she were alive today, she probably could have written the very same words and would have seemed current. Roosevelt was an admirable woman and she worked hard to promote social justice around the world. She served for a long time as the American voice in the United Nations. President Harry S. Truman appointed Eleanor as a delegate to the United Nations General Assembly in December 1945. She was the first chairperson of the United Nations Commission on Human Rights, and was instrumental in drafting the Universal Declaration of Human Rights. The Universal Declaration of Human Rights is examined in two books for children, Stand Up For Your Rights [J 341.4 STA], and We Are All Born Free: The Universal Declaration of Human Rights in Pictures [JP WE]. Today, February 20, is also the day the United Natins has marked as "World Day of Social Justice." To learn more, click here. Photo courtesy Franklin D. Roosevelt Presidential Library. Many famous people struggle with the mangling of their names. In the earlier days of Hollywood, actors were instructed to change ethnic-sounding names to make them more "acceptable" to a WASP audience, and, to make then pronounceable. This "renaming" continued for many years. The issue of name changes is undoubtedly touched upon in Hollywood Remembered: An Oral History of Its Golden Age by Paul Zollo [384.8 ZOL] or Women in Hollywood: From Vamp to Studio Head by Dawn B. Sova [384.8 SOV], or any of the film history books found in our collection. The Library is closed today for the President's Day federal holiday. Students in elementary and secondary schools are finding that the teaching of social studies (what used to be called "civics"), is falling by the wayside due to national testing. So, the Library is attempting to close the gap for students by having items available to cover the subject, and, for those interested in learning more about the presidency, we have a DVD, part of the "Just the Facts Learning Series," American History: History and Functions of the Presidency [DVD 352.23 UNI]. If only it were this easy to proclaim it "Spring!" The picture above was taken after the recent nor'easter. Will you send me one of yours? My friend, Linda, at Teacher Dance, is hosting this week's Poetry Friday Round-Up. Tell her I sent you! If asked, Charlie Brown would probably tell you that today, Valentine's Day, is the holiday he likes the least. 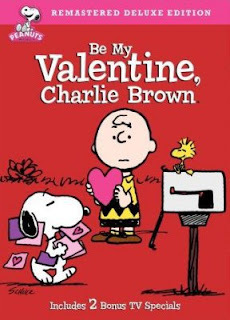 What with unrequited love, and a scarcity of valentines in his classroom cubby, poor Charlie Brown is one miserable boy. Every once in a while, I come across a time-sucker that is really worth sharing with you. Silk is one. You create designs that are beautiful. And the site itself is hypnotic. So, a word of warning: DO NOT click here if you are at work. No visiting time-sucking internet sites while at work! If you must have a look now, click here for a sample. Whether it's artistic design, industrial design, web design, horticultural design, or even intelligent design, we have it at the library. Glimmer: How Design Can Transform Your Life, and Maybe Even the World by Warren Berger [745.2 BER], explores the principles of renowned designer Bruce Mau. Andrew Lawson's The Gardener's Book of Color: Creating Contrasts, Harmonies, and Multicolor Themes in Your Garden [712 LAW] will have cursing the snow and wishing for spring. For a kid's introduction to industrial design, look for Toilets, Toasters & Telephones: The How and Why of Everyday Objects by Susan Goldman Rubin [J 683.8 RUB]. Speaking of industrial design, Yanko Design is "a web magazine dedicated to introducing the best modern international design, covering from industrial design, concepts, technology, interior design, architecture, exhibition and fashion. It’s about the cutting edge and the classic, the new and the rediscovered. It’s all about the best. News." I get an daily email summary from Yanko Design that always amazes me! Monkey Girl: Evolution, Education, Religion, and the Battle for America's Soul by Edward Humes [231.7652 HUM] chronicles one evolution vs. intelligent design case that took place in Pennsylvania. The snowstorm of last weekend, although not a record-breaker here, certainly was a giant pain in the you-know-what! Fortunately, Windham did not lose power, as it has done so many times in the past. 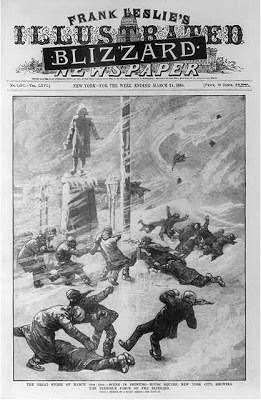 Our recent nor'easter doesn't begin to compare to the storm that hit New York City March 12-13 1888. 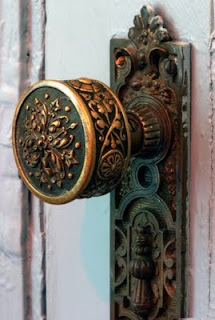 The Bowery Boys blog covers N.Y.C. history, and last week they featured a post, with photos, of the Blizzard of '88. Check it out and pay particular attention to the system of electrical and telephone wires. All that mess was eventually placed underground for obvious reasons! We have some fascinating books about wild weather events, including one by WMUR's weatherman, Josh Judge: Extreme New England Weather [551.55 JUD]. Photo of Frank Leslie's Illustrated Newspaper courtesy Library of Congress. 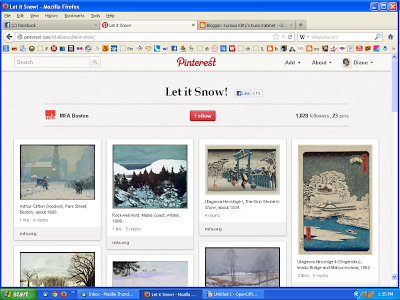 On Friday, in the midst of the storm, I browsed through the Museum of Fine Art's Pinterest board, "Let It Snow!" It was a pleasant way to pass the time while waiting for the storm to move through. The MFA has 24 different Pinterest boards, so if you can't take another reference to snow, you may want to try the "Summer" or "Artful Traveling" boards instead. The internet has opened up the world of art to anyone with access to a computer. I now get a daily email, "Art of the Day," which exposes me to a work of art and provides a bit of explanation of what I'm looking at. You can sign up, too, or, you can see all the featured art gathered in one place, here. You may prefer to get your art live, or from books, if so, we've got you covered with museum passes (MFA, Currier, PEM) and a nice collection of illustrated, and how-to, art books waiting for you! 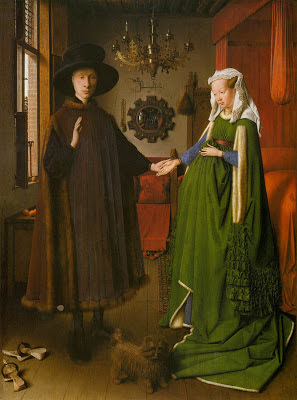 Poetry Friday--"The Dogs in Dutch Paintings"
Jan van Eyke, "Portrait of Giovanni Arnolfini and His Wife," courtesy Web Gallery of Art. dead center in each oblivious household. in the foreground of some martyrdom. against a table leg, the feast above continuing? as a hound sagely ponders an upturned turtle? in the corners of the world's dazzlement. How could you not like a poem about dogs and art? The common dog found in the painted scenes of great occasions, doing what dogs do best--snoozing, sprawling, snapping, and being totally unconcerned! The Poetry Friday Round-Up is being held at A Teaching Life. A house cat recently found her way home from Daytona to West Palm Beach, Florida, a journey of over 200 miles. It took her two months! No one is sure how she was able to do it, but she did. You can read about the remarkable feline here, or watch the video below. A children's classic is the novel, The Incredible Journey by Sheila Burnford [J BUR], in which two dogs and a cat make their way home across the Canadian wilderness. I'm sure Burnford had heard about an animal journeying home after being lost, or abandoned, and was inspired to write the book. The three animals were based on actual pets the writer owned. 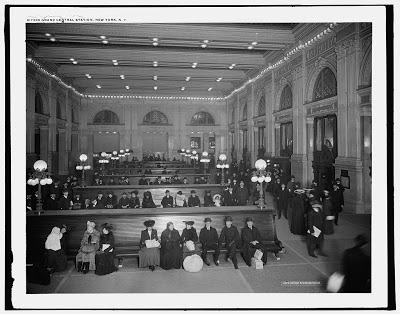 1904 Grand Central Station photo courtesy Library of Congress. 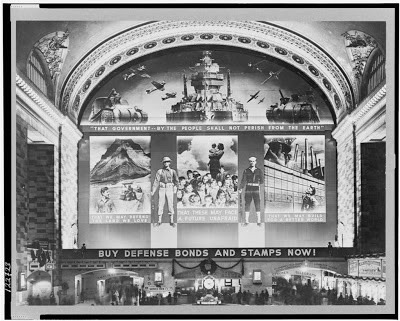 1941 Grand Central Station photo courtesy Library of Congress. In the days before the abundance of cars and highways people traveled by train. Large and busy stations were common in metropolitan areas, but even small country towns, such as Windham, had depots. Windham's little station still exists as a building, but no longer as an active part of a railroad system. 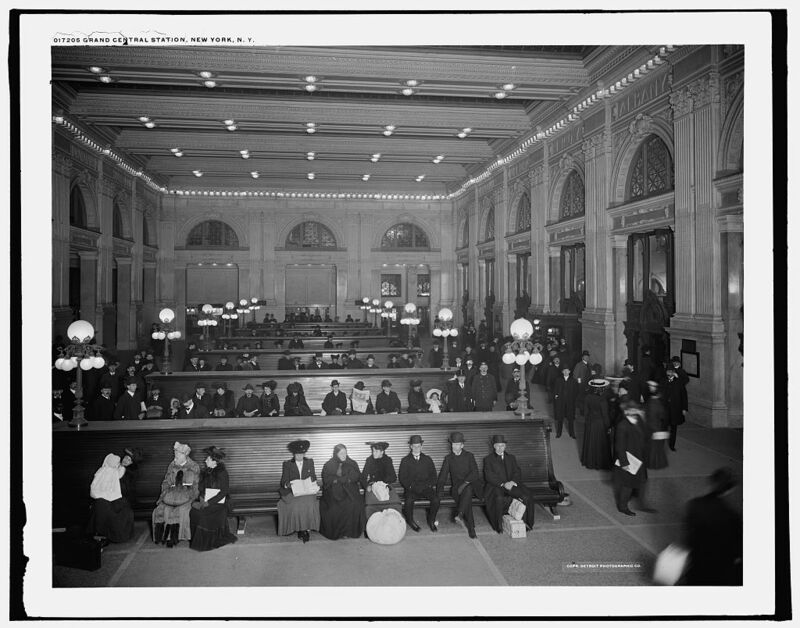 Grand Central Station in New York is celebrating the 100th year of its present building (another building existed before 1913), and NPR recently presented a slideshow celebrating "The Ways We Wait: A Train Station Tribute For Grand Central's 100th." If you find train stations as fascinating as I do, then you'll want to look for a lavishly photo-illustrated book Railroad Stations: The Buildings that Linked the Nation by David Naylor [725.31 NAY]. Chōngjī yóuxì = The Hunger Games. Hopefully I'll live long enough to see the discovery of the cure for the common cold, but for now, I'm hoping to just live through this day! The best argument for verse memorization may be that it provides us with knowledge of a qualitatively and physiologically different variety: you take the poem inside you, into your brain chemistry if not your blood, and you know it at a deeper, bodily level than if you simply read it off a screen. "You take the poem inside you..." interesting observation. So what's a good poem to memorize? I'd say shorter is better, but the book, Committed to Memory: 100 Best Poems to Memorize, edited by John Hollander [821.008 COM], disagrees, since the majority listed are longer than the 14-line sonnet, of which there are 11, and only one of the 100 is a quatrain! Hollander states, "Rhyming accentual-syllabic verse is always a great aid to memorizing." On this I have to agree. The only poem I memorized in my youth was "If" by Rudyard Kipling, and I never would have made it if it hadn't rhymed! 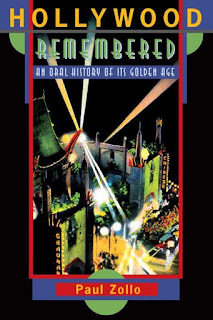 Sadly, all I can remember of it today is its opening. Hollander also chose "If" as good to memorize and it is #56 on his list of 100 best. If you're looking for more poetry today, head over to Teaching Authors for the Poetry Friday Round-Up.